The mixed doubles final brought down the curtain on Wimbledon 2018 – that’s a wrap! I think it’s been a good Wimbledon for the women, perhaps missing that one stand-out wow match. 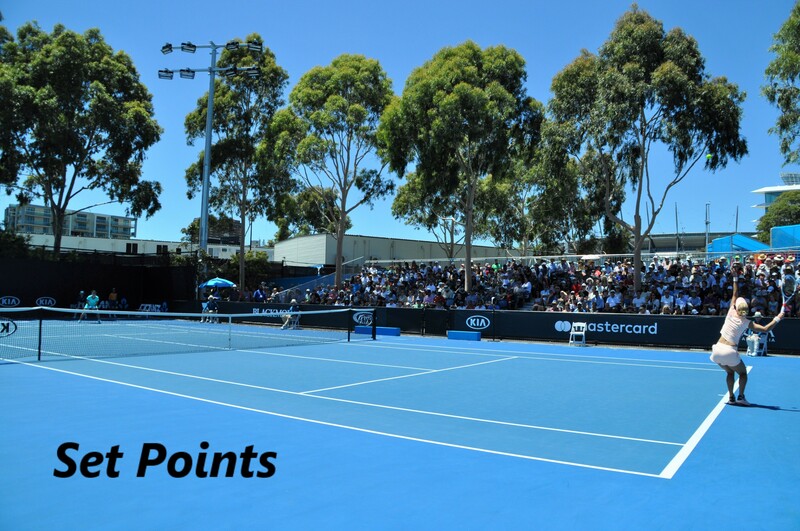 This Set Points post brings together stories from the last day and with a quick look back at some of my personal highlights from the 2018 grass court season. Angelique Kerber won her third Slam with a 6-3 6-3 win over Serena Williams on Saturday. I wrote about the final HERE. I loved Angie’s tweet on Saturday and I will never tire of seeing her beaming smile 😁. Serena Williams has made #Wimbledon her own. Steffi Graf did the same. Angelique Kerber defeated Serena to join Steffi on the honor roll of champions at SW19. Barbora Krejcikova and Katerina Siniakova won their first Wimbledon title with a 6-4 4-6 6-0 win over Nicole Melichar and Kveta Peschke on Saturday evening. The Czech pair were absolutely peak in the third set! I’m annoyed that the women’s doubles match was moved to No.1 Court. All four players earnt their spot on Centre Court. I thought we might get through the tournament without any major scheduling issues. While a disappointing end, I was encouraged to see more women’s matches make the top two courts in the first week. I’m pleased that the Czech pair got their moment on Centre Court after the men’s doubles final. The photographers were urging them to raise their trophies above their heads which they finally did! A really incredible effort to do the double of winning the French Open AND Wimbledon. This was a lovely piece from Ben Rothenberg. Nicole Melichar and Alexander Peya both won their first Slam titles on Sunday with a 7-6(1) 6-3 win over Victoria Azarenka and Jamie Murray. I really thought Azarenka and Murray were going to win this, particularly having had so many tough matches in the tournament. All the credit to Melichar and Peya who played a brilliant match and didn’t waver at all at the end. I was disappointed by some of the commentary on the BBC – there was a comment in the second set criticising Azarenka and implying she wasn’t supporting Murray! From what I saw of the match and from their previous matches, it was Azarenka who was carrying Murray. It just wasn’t their day on this occasion. With that final result, Wimbledon 2018 came to a close. A shout out to Mert for this excellent write-up on the Kerber-Kasatkina quarter-final. I really enjoy these detailed posts and I always learn so much! If you’re not already, go give Mert a follow on Twitter and check out his site at Mertov’s Tennis Desk. In defeating #Kasatkina in two tight sets, #Kerber showed once again why she is one of the fiercest competitors in women's tennis..
Tennis just keeps on giving… i’m not ready! This main draw for Gstaad next week is decent with Schiavone-Stosur and Bacsinszky-Bouchard the highlights from the first round. I’ve got everything crossed for Timea. There’s also a WTA International in Bucharest where there are eight Romanian players in the draw and this could increase once the qualifying has finished. I’m not surprised by this but I am very sad to hear that the Hopman Cup is set to be ending in 2019. It’s such a unique event and I absolutely loved going this year. I urge anyone who can… goooo next year! I adore Perth. Seriously, screw the ATP. It’s been three crazy weeks of tennis. It all started back in Eastbourne (feels years ago) where I had the opportunity to attend the tournament as media for the third time. It was another surreal experience, still scary but very rewarding, and I was trying to just soak it all in! Getting to do a one-to-one interview with Jo Konta will definitely stand as one of my highlights of 2018. I was also thrilled to ask one of my faves, Daria Kasatkina, a few questions in one of her press conferences. I got to meet so many great people during the tournament. It’s the one week where I am surprisingly sociable 😂. A particular highlight was getting to meet one of my blog readers from Canada. Thanks, Alexander! Then it was onto Wimbledon where I was lucky enough to go on the first Wednesday. I was honoured to be invited onto the Tennis with an Accent podcast before the tournament to talk about the women’s draw. Everything I predicted was wrong (😂) but it was still a good experience. Wimbledon is always hectic and I still push myself hard on the blog. It’s one of the rare times when I have the freedom to write with some time off from my day job so I like to take advantage of this. Thanks for reading and for all your comments during the last few weeks. I need a break from tennis and I want to get back into baking too. I’ve got thousands of tennis pictures still to process! I’d like to be back for Stanford/Washington but I will see how I feel. I’m positive moving forward to the US Open series and it’s a stage of the season that i’ve become more and more fond of with time. ← Wimbledon 2018 Final Match Review: Angelique Kerber wins 3rd Slam title! Thanks for everything James. Wimbledon is my favourite tennis tournament of the year and my 2nd favourite sporting event and reading your blogs with a lot of insight and knowledge adds to the enjoyment. Enjoy your rest away from tennis. You deserve it….and here is a link for a recipe to make a tennis cake ! Thanks, Peter. Really means a lot to me that you enjoyed the posts and cheers for all the comments/tweets, always enjoy reading them! Men’s tennis is so much more interesting again now that Novak is back in form. I’ll be very interested to see whether how he finishes the year and how Rafa and Federer respond to his return. It was a good Slam for the men. Nadal-DelPo and Djokovic-Nadal were both great matches. I echo Peter’s remarks on your excellent blog! I still find it amazing that Kerber has won 3 Grand Slams but only 7 other tournaments. A very unusual ratio. Only 2 of the top 45 WTA players are in the clay court tournaments in Bucharest and Gstaad this week. It appears most of the top players are joining The Moo on a holiday from tennis. This would be a good week for a clay courter to pick up money, points, and a trophy. I am picking Doc Buz, who plays singles and dubs every week, to win her home tournament in Bucharest. Muguruza’s record is a good one too – 1/3 of her 6 titles are Slams! James, thanks for the Matt Zemek link, defintely a superb analysis. The site I looked at didn’t include the 2012 wins —- unless you hit the ‘show more’ button. I saw a photo of Iga at the Warsaw airport surrounded by about 15 members of the Polish news media. I feel like they need to change/clarify the junior Slams a little. I don’t really feel like a 17 year old with 5 ITF titles should be allowed to compete. She’s pretty much an adult at this point. Cori Guaff lost to a girl who has been playing on the adult circuit for almost a year, for example. To me that just isn’t fair. I agree Andrew, more clarification is needed when someone like Marta Kostyuk was competing in the main draws of slams at the age of 15 (she turned 16 last month). Well Kostyuk is no longer playing junior events at 16. Yet there are girls almost 18 who still are. For me, I think once you turn 17 you no longer play juniors. Once you’ve played 3 or more pro events then you no longer play juniors. This girl who won Wimbledon has won 5 ITF titles and hasn’t played in a non-Slam junior tournament in a year. Wim Fissette has said that he things Angie can still improve; he’s looking at her serve as something he thinks she still needs to work on. If that’s the case, then the rest of the tour had better watch out. (Still think Jo Konta should have stuck with him instead of Michael Joyce, who doesn’t seem to have done her game much good). Doc Buz was clearly the better player, but kept trying to hit winners from a weak position, which led to a number of UFEs. When Doc Buz changed to a more controlled game she won most points, but the match was close. It appeared that Buz was still using grass court tactics on a clay court. Zidansek has talent. Zid has won 16 ITF events and a 125K WTA tournament and will be playing in Moscow next week. In several of the rallies Zid outplayed Doc Buz, with good power and court tactics. Doc Buz’s better power and experience gave her the edge in the match. Zidansek( 20y/o, Slovenia) is another young player for The Moo to keep another eye on. I believe this makes about 15 new eyes The Moo has grown to keep track of the new talent, which, no doubt, causes more than a bit of conversation at the office. Haha have yet to watch Zidansek play! I believe it is Mandy (Minella)’s first ever WTA final today, against Alize Cornet in Gstaad. I like Alize but I wouldn’t be too sad if Mandy wins; at 32 she’s waited long enough for her first title. Also Petra Martic faces off against Anastasija Sevastova in Bucharest. According to Wikipedia it’s Petra’s second WTA final (her first was in Kuala Lumpur in 2012). Great win from Alize in Gstaad yesterday, to secure her sixth WTA title and move back into the top 40 in the rankings, though Mandy had a good run in the tournament too. Timi Bacsinszky and Lara Arruabarrena came close in the women’s doubles but ultimately had to settle for the runners-up trophy behind Alexa Guarachi and Desirae Krawczyk whose first WTA doubles title it was. Mama Minella (October 2017) from the tennis powerhouse of Luxembourg. Question for The Moo — Why are there no Irish tennis players in the WTA? I think the top Irish player is ranked about 750th. Upsets continue with Kasatkina (R #13) def by Zidansek ( R #90) 6-4,2-6,6-4. The players both played a similar game, but Kas seemed to be unmotivated, which is strange since the event is in Russia. Zid plays Siegemund tomorrow. Sevastova(R #20) had a difficult time with Bara(R #140) 6-2,6-7,6-4. Sevastova did have a MTO for a possible lower back or hip problem. Wimbledon girls champ Swiatek is into the QFs tomorrow with Barthel. ITF Prague. No idea about why there are no Irish players on the WTA. The only Irish player I can remember of late is James McGee who seems to have stepped away from tennis for now. I know it’s a home tournament but otherwise didn’t see much worth in Kasatkina playing Moscow with the tour moving to hard courts next week. This could be the big breakthrough tournament for any of the final four players. 2) Danilova (LL) beat Schmiedlova, Kanepi, and #1 seed Goerges to get into the semis. Danilova also beat Sevastova in a Fed Cup.match. 1) Zidansek beat Kasatkina and Siegemund to reach the semis. IMO Zid’s biggest assets are her racket control and her mind. Zid uses angles, with good racket control, to put her opponent into a weak hitting position. All players are coached to to do this, but in the heat of a match very few can do this effectively and consistently. Zidansek is my pick to win the Moscow on the River Cup. How did Danilovic become Danilova? Both of my picks went belly up. Zidansek in Moscow became sick during the match and retired down 2-5 in the 3rd set. Ah well! Interesting final in Moscow. Might try and catch some that tomorrow. Swiatek is into the semis in Prague and my pick to win the trophy. Siegemund is playing two small ITF (25K & 60K) events the next two weeks on clay, no doubt, still protecting her knee while getting match play. Bouchard is playing in two upcoming hard court ITF events in Lexington and Vancouver. The $100K event in Vancouver Aug 13 has a number of ‘names’ entered as alternates to the qualifying.